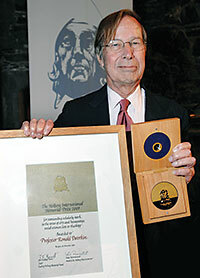 New York University Law Professor Ronald M. Dworkin, who is widely considered among the most influential theorists on ethics and morality in law, won the 2007 Ludvig Holberg International Memorial Prize, carrying a cash prize of 4.5 million kroner (at press time, roughly equivalent to $870,000). A faculty member since 1975, Dworkin is the fourth winner of the annual award—named for the Dano-Norwegian playwright and author of the Age of Enlightenment—which is modeled on the Nobel Prize. The committee highlighted six of his books, including Law’s Empire, Life’s Dominion and Is Democracy Possible Here? Dworkin argues that the legal system should be seen as having two parts: rules set by law and principles of a moral nature. But when the law is fuzzy, he asserts, judges must interpret the law using evolving principles of justice and fairness.